Hair. We’ve all got it. For most of us, it’s a fashion accessory at best and a nuisance at worst. But with the right outlook, hair can be turned into a powerful opportunity for spiritual development. 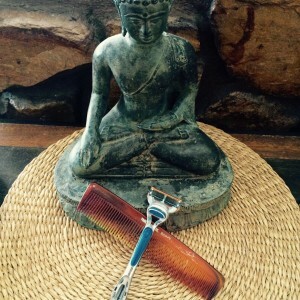 Both close shaves and lengthy manes have been used by a wide range of spiritual practitioners for thousands of years. Native Americans, Sikhs, and Rastafarians cultivate long hair as a spiritual practice that shows strength and devotion. And remember Samson, the Old-Testament hero whose strength was derived from his seven locks? Alternatively, the Buddha instructed his devotees to shave their heads to demonstrate a commitment to living a good and holy life. Even the U.S. Army gives buzz cuts to new recruits as a rite of passage that signifies transcendence of individualistic identity. Here at Center for Mindful Learning, we practice both Awakening (inner development and transcending the world) and Responsibility (transformative action to make the world a better place). Parallels can be drawn between Awakening and Responsibility and spiritual hair practices. On one side, shaving our hair, we shed ego-based vanity and attachment, thus expressing the principle of Awakening. On the other hand, the care required for maintaining long hair (washing, conditioning, brushing) embodies the compassionate nature of Responsibility. So. Each of these two approaches to hair represents one of the two sides of spirituality. Awesome. But how could I choose just one? Awakening without Responsibility is reclusivity. And Responsibility without Awakening leads to myopic self-righteousness. 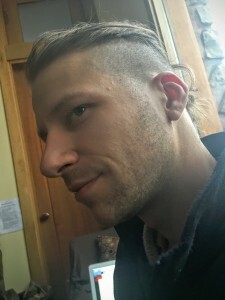 Thus, I decided to do both by coupling long, manicured locks on the top with a short, simple buzz on the sides. However, the style itself is only part of the practice; I decided to utilize the act itself of cutting the hair as a spiritual exercise. Each month the Center for Mindful Learning’s Modern Monastic Team dedicates one week to a silent mindfulness intensive. The night before the meditation retreat begins, my Modern Monk Michael Fogleman and I gather to cut our hair. Michael has decided that the only hair he will keep is his beard (beards also have cross-cultural spiritual significance). As we cut each others’ hair, Michael and I reaffirm our dedication to realizing deep insight in the upcoming retreat. With each pass of the hair clippers, we affirm our unwavering commitment to shed our egos and recognize the true nature of reality, so that we might better serve all life on Earth. Also, it’s kind of fun. In this way, both the style of the hair and the act of cutting it become spiritual practice. What is your relationship to your hair? What other seemingly mundane facets of daily life (like brushing your teeth or cooking dinner) could be creatively transformed into spiritual rituals? Would you like me to give you a haircut? Peter has always aimed to make the world a better place. At age fifteen, he volunteered for a progressive mayoral candidate, and got hooked on social change. While attaining a Master’s degrees in Political Science and Sustainable Business, he threw himself into a career as an advocate and organizer for democracy, human rights, and the environment.A decade of championing progressive causes introduced Peter to the challenges of apathy, burnout, and corruption. Searching for answers, Peter turned inward through lucid dreaming, labyrinth walking, and wilderness meditation. Direct experience of interconnectivity and compassion renewed Peter’s calling, and recurring dreams brought him to lead workshops on meditation, mindfulness, and lucid dreaming.By living in a community that uses mindfulness to help others, Peter is learning to harness the metamorphic power of contemplative practice for building a loving and harmonious world.